A bowl glazed with sediments from Fukushima, Japan registers no more than background radiation and provides an entrez for learning about radiation in the environment. The seafloor is a treasure trove of information for scientists hoping to glean a better understanding of ocean processes, both past and present. The color and texture of the mud, as well as the organisms that inhabit it, all hold clues. But what happens to sediment samples when scientists are done with them? Here in Woods Hole, these cast-offs of oceanographic exploration are getting a second life at The Soft Earth Pottery studio, where artist Joan Lederman uses them to glaze her ceramics. The same characteristics that are so informative for scientists make ocean sediments unique glazes. Tiny seashells from organisms called foraminifera store information about the climate in which they live; in a glaze, they give texture and allow the glaze to move and form the gorgeous branching, or dendritic, patterns that grace many of Lederman's pieces. 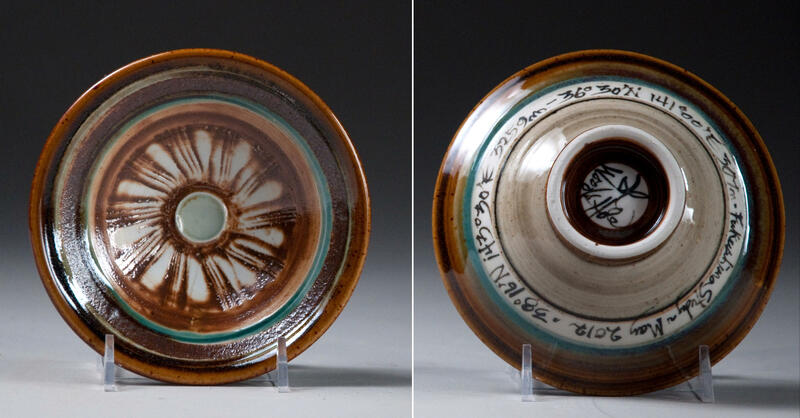 But Lederman's pottery is more than just beautiful. Lederman says that using ocean sediments in her work gives her a visceral connection to the processes that form the planet. Dr. Ken Buesseler, a marine chemist who has been studying the aftermath of the Fukushima nuclear disaster and sharing sediments with Lederman, says the pottery pulls him out of the academic ether and grounds him and his science in reality. Both say that Lederman's pieces pique people's curiosity and provide and entrez for talking and learning about ocean science. Indeed, Lederman says that using ocean sediments as glazes satisfies her long-standing desire to bridge what she calls the art-science dichotomy, although she says that's a dichotomy that doesn't exist in her brain. She sees art and science as two parts of an integrated approach to understanding the world. Lederman says she has a vision for sharing that view and experience with students through a Dream Lab ... but that's a story for another day. In the meantime, you can keep up with Lederman's exploits on her blog.